A major goal in the field of molecular electronics, which aims to use single molecules as electronic components, is to make a device where a quantized, controllable flow of charge can be achieved at room temperature. A first step in this field is for researchers to demonstrate that single molecules can function as reproducible circuit elements such as transistors or diodes that can easily operate at room temperature. A team led by Latha Venkataraman, professor of applied physics and chemistry at Columbia Engineering and Xavier Roy, assistant professor of chemistry (Arts & Sciences), published a study in Nature Nanotechnology that is the first to reproducibly demonstrate current blockade—the ability to switch a device from the insulating to the conducting state where charge is added and removed one electron at a time—using atomically precise molecular clusters at room temperature. Bonnie Choi, a graduate student in the Roy group and co-lead author of the work, created a single cluster of geometrically ordered atoms with an inorganic core made of just 14 atoms—resulting in a diameter of about 0.5 nanometers—and positioned linkers that wired the core to two gold electrodes, much as a resistor is soldered to two metal electrodes to form a macroscopic electrical circuit (e.g. the filament in a light bulb). The researchers used a scanning tunneling microscope technique that they have pioneered to make junctions comprising a single cluster connected to the two gold electrodes, which enabled them to characterize its electrical response as they varied the applied bias voltage. The technique allows them to fabricate and measure thousands of junctions with reproducible transport characteristics. "We found that these clusters can perform very well as room-temperature nanoscale diodes whose electrical response we can tailor by changing their chemical composition," says Venkataraman. "Theoretically, a single atom is the smallest limit, but single-atom devices cannot be fabricated and stabilized at room temperature. With these molecular clusters, we have complete control over their structure with atomic precision and can change the elemental composition and structure in a controllable manner to elicit certain electrical response." A number of studies have used quantum dots to produce the similar effects but because the dots are much larger and not uniform in size, due to the nature of their synthesis, the results have not been reproducible—not every device made with quantum dots behaved the same way. The Venkataraman-Roy team worked with smaller inorganic molecular clusters that were identical in shape and size, so they knew exactly—down to the atomic scale—what they were measuring. "Most of the other studies created single-molecule devices that functioned as single-electron transistors at four degrees Kelvin, but for any real-world application, these devices need to work at room temperature. And ours do," says Giacomo Lovat, a postdoctoral researcher and co-lead author of the paper. 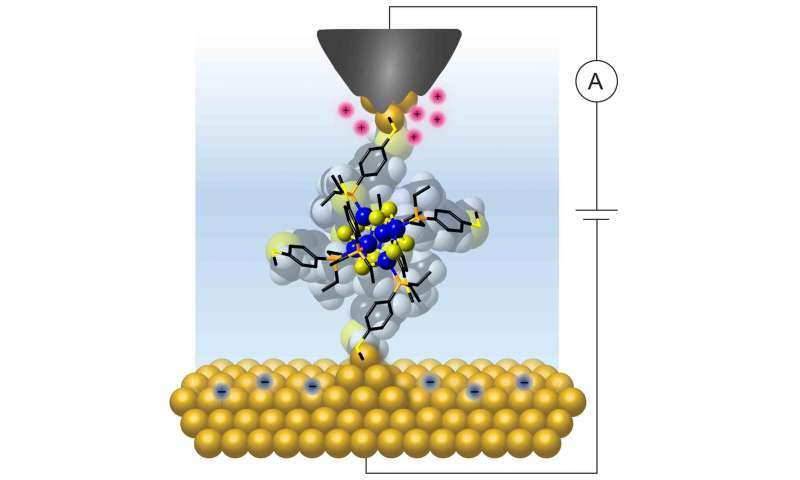 "We've built a molecular-scale transistor with multiple states and functionalities, in which we have control over the precise amount of charge that flows through. It's fascinating to see that simple chemical changes within a molecule, can have a profound influence on the electronic structure of molecules, leading to different electrical properties." The team evaluated the performance of the diode through the on/off ratio, which is the ratio between the current flowing through the device when it is switched on and the residual current still present in its "off" state. At room temperature, they observed an on/off ratio of about 600 in single-cluster junctions, higher than any other single-molecule devices measured to date. Particularly interesting was the fact that these junctions were characterized by a "sequential" mode of charge flow; each electron transiting through a cluster junction stopped on the cluster for a while. Usually, in small-molecule junctions, electrons "pushed" through the junction by the applied bias make the leap continuously, from one electrode into the other, so that the number of electrons on the molecule at each instant of time is not well-defined. "We say the cluster becomes 'charged' since, for a short time interval before the transiting electron jumps off into the other metal electrode, it stores one extra charge," says Roy. "Such sequential, or discrete, conduction mode is due to the cluster's peculiar electronic structure that confines electrons in strongly localized orbitals. These orbitals also account for the observed 'current blockade' regime when a low bias voltage is applied to a cluster junction. The current drops to a very small value at low voltage as electrons in the metal contact don't have enough energy to occupy one of the cluster orbitals. As the voltage is increased, the first cluster orbital that becomes energetically accessible opens up a viable route for electrons that can now jump on and off the cluster, resulting in consecutive 'charging' and 'discharging' events. The blockade is lifted, and current starts flowing across the junction." The researchers tailored the clusters to explore the impact of compositional change on the clusters' electrical response and plan to build upon their initial study. They will design improved cluster systems with better electrical performances (e.g. higher on/off current ratio, different accessible states), and increase the number of atoms in the cluster core while maintaining the atomic precision and uniformity of the compound. This would increase the number of energy levels, each corresponding to a certain electron orbit that they can access with their voltage window. Increasing the energy levels would impact the on/off ratio of the device, perhaps also decreasing the power needed for switching on the device if more energy levels become accessible for transiting electrons at low bias voltages. "Most single-molecule transport investigations have been performed on simple organic molecules because they are easier to work with," Venkataraman notes. "Our collaborative effort here through the Columbia Nano Initiative bridges chemistry and physics, enabling us to experiment with new compounds, such as these molecular clusters, that may not only be more synthetically challenging, but also more interesting as electrical components."